Revelstoke barbecue chef Glen Cherlet plans on hitting up competition circuit this summer — and he'll cater your party too. “It all starts with the difference between barbeque and grilling,” says pitmaster Glen Cherlet as hickory smoke and the smell of slow cooked meat fill the air behind him. He’s been cooking since three in the afternoon the previous day — a 20-hour affair. Grilling, Cherlet says, is quick and powered by propane. Barbecue, with a history that harkens back to the cotton fields of the South, is cooked over charcoal or wood, and uses traditionally cheap cuts of meat smoked at low heat slowly. Filled with blood, gristle and sinew, it needed to be. Among Cherlet’s ingredients today are locally sourced chicken thighs, pork shoulder, brisket, paprika, chili powder, garlic, and apple juice. Only he knows the exact measurements. The demanding overnight process entails putting together his rub of spices, running them through a coffee grinder to get the blend uniform, trimming and marinating his locally sourced meat, stoking his smoker, and monitoring it throughout the night to ensure an even cooking process. He served up the goods to passer-bys during Saturday’s downtown street sale. 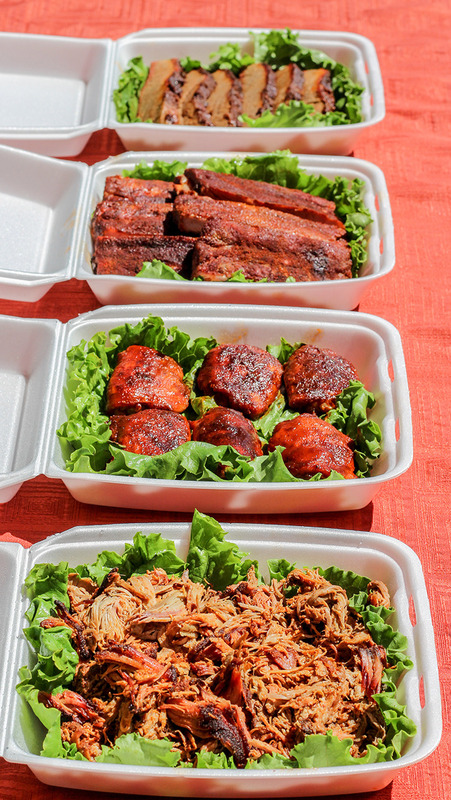 This is Cherlet’s trial run for competition this summer and Begbie BBQ delivers the goods. Not that we should be surprised. In 2011, as a chef at Great White North, Cherlet took home top honours at the “Revelstoke Rib-Off.” He then regularly hosted popular BBQ events at the Eatery on the Green, part of the Revelstoke Golf club, before opening his own catering company and pursuing his dream in competition BBQ. “I’d go nuts — I ‘d go bananas if I wasn’t following my dream,” he says. For Cherlet, BBQ constitutes its own art form: it’s all about presentation, texture, tenderness and appearance. On the competition circuit each of these categories is judged rigorously, putting chicken, ribs, brisket and pulled pork to the test. In a window of only 10 minutes all of these must be presented to the judges; one second late and you are automatically disqualified. As much as $50,000 per cut of meat is up for grabs this year at the Jack Daniels BBQ Invitational in Lynchburg, Tennessee. Fortunately, as a certified Pacific North West BBQ Association judge, Cherlet knows exactly what to look for in his cooking. He brings 25 years of experience in the restaurant business to the competition barbecue circuit this summer. The end goal is to open up his own smokehouse right here in Revelstoke with his wife Nicole, who’s his personal (and certified) BBQ judge, and the proprietor of Big Mountain Kitchen & Linen. Cherlet plans to hit three competitions this summer, starting his adventure at the Canadian Festival of BBQ and Chili in Langley, BC, on June 20–21. Cherlet explains his plans are predicated upon a number of different variables — procuring sponsorship and funding among the most pressing. Currently, Begbie BBQ & Catering is in the process of raising money to support Cherlet’s dream. The pitmaster is available to cater your next dinner party and can be reached at Begbiebbq@Gmail.com.